SM Foundation turned over its 28th military health center improvement project to the Marine Barracks Gregorio Lim Medical Dispensary in Ternate, Cavite, the basic training ground and home for over 800 rookie marines, as the Christmas gift of Mr. Henry Sy and children to the men in uniform. This is the 148th health and wellness center that the Foundation has improved and upgraded throughout the country and the 28th for the Armed Forces of the Philippines. 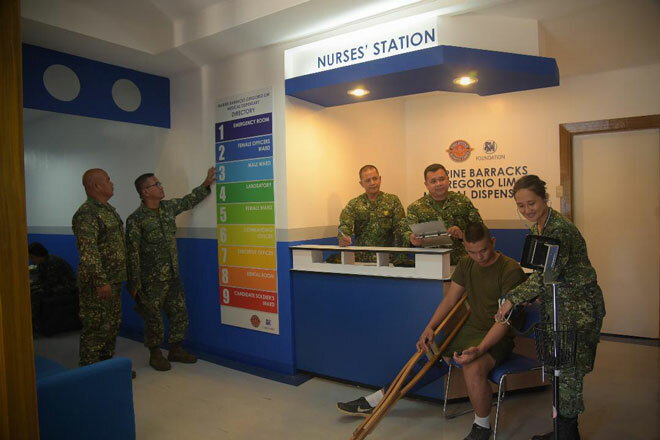 Headed by Col. Pavina Aguinaldo, an MD, the improved dispensary has an emergency room, female officers ward, male ward, laboratory, female ward, commanding officer’s room, an office of the executive officer of the dispensary, dental room and candidate soldier’s ward. At the turnover, four patients happened to be confined in the dispensary: a woman marine aspirant, Angelica Ogot, 25; a male soldier-to-be, Leonel Bugis, 21, from the 7th Battalion in South Cotabato but has been a soldier for two years but asked for further schooling prior to assignment in Mindanao. Two soldiers with leg injuries using crutches.. They are all rookies, though injured, are determined to go through the hard training program until they get their new posting possibly in Mindanao. The female marine-aspirant in fact said she has always dreamed of becoming a soldier someday. “We’re deeply honored to be able to contribute, in our own little way to those who serve our country. And so, to complete the package, we commit to help you with the maintenance and upkeep of the facilities that we have improved because we are aware that maintenance have always been a problem of beneficiaries of renovated structures such as this,” Angeles said. This statement brought loud cheers from the marine officers led by Col. Jimmy Larida, chief of staff of Maj. Gen. Alvin Parreno, commanding general of the Philippine Marine Corps (PMC), who gave the response. The deed of donation was signed by Angeles, Larida (on behalf of MGen. Parreno) and Col. Aguinaldo in the presence of the full-force of SM Group operating in Cavite province and from SM Foundation. Col. Larida said the improved facility will go a long way in boosting the morale of the rookies and other marine forces operating in the country who would be needing immediate medical attention. Angeles said that for several years now, SM Foundation has been renovating and refurbishing the military health facilities to help the men in uniform heal faster and feel the concern of the people they are protecting from lawlessness and for the defense and security of the nation. Larida said the marines in the battle field will be at their highest morale knowing that partners like SM are taking care of their needs through quality facilities. The marines have been able to sustain the fight in defending the Filipino people, because they know the citizens are by their side. 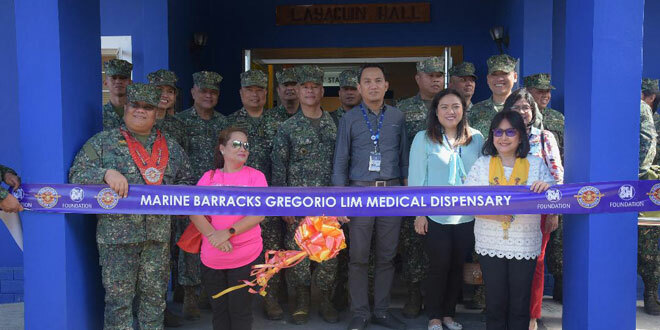 This medical dispensary caters to the needs of marine personnel stationed in the Marine Barracks Gregorio Lim especially the candidate soldiers and students of the marine force development center, Larida said adding that the barracks is the only “factory” of PMC. “May this improved dispensary help our candidate and battle field soldiers recover, recuperate and return to their duties,” Larida said. The upgrading of the dispensary was endorsed by Col. Jocelyn Turla from the medical service and former chief surgeon of the Navy to the foundation.